Life is filled with suffering, but also with beauty. When I suffer I naturally seek beauty—a walk in the woods or on the beach, a bike ride down country roads, or staring up at the night sky or into an emerging dawn. Somehow being present to Beauty consoles me and imparts a sense of purpose to my suffering. The hearings involving testimonies regarding President Trump’s Supreme Court justice nominee, and his accuser, personally disturbed on many levels. I am grateful for the wooded path along the river, and my bike and country roads, that comfort me. The sexual and psychological abuse I experienced as a child, and then later in my workplace, and again in medical settings, all came back with unsettling detail. The darkness of perverse power is overwhelming. Further suffering is guaranteed for bringing abuse into the light. You are damned if you do and you are damned if you don’t. I know the real fears of women who do not come forward with abuse allegations because of the added suffering that gets heaped on top of the initial offense. Somehow, understanding both sides of this suffering, those of the perpetrator and the victim, is key to understanding the way to love and peace. So I have been walking the woods, riding my bike, and breathing from my heart to move me toward peace. Understanding that most boys are raised in patriarchal systems has been helpful. The dictionary defines patriarchy as “a family, group, or government controlled by a man or a group of men.” It is more than daughters who suffer from the patriarchal model. Sons, and the whole of society are deprived of integrated gifts both genders have to offer. Someday, equal integrated shares of both male and female gifts will form the foundation for freedom, justice and peace in the world. When I was halfway through writing my memoire, God Never Hurries, I got stuck and could not continue writing until I acknowledged my father’s abuse. It was not well received by many. But now, more than ever, I know it was the right thing to do. I tried writing posts the past several weeks but couldn’t finish them, until I let myself write this one. If you have found events from the past week disturbing, I invite you to look for Beauty, breathe from you heart where the Great Mystery resides, and wait to be filled with empathy and compassion for all parties involved in this heart wrenching drama our country is experiencing. I wish you peace. What if we all learned to breathe from our hearts—would patriarchy cease to exist? It's inadequate but I can't find the words for more this morning. There are too damn many of us saying #Me too. 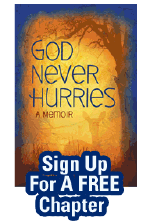 God Never Hurries? Good thing, because I'm pretty slow myself. Yesterday was full of those little synergies that tell me that the universe is watching, it has my back, I'm headed in the right direction. I started reading your book when you gave it to me - two years ago? Reading is difficult for me. Chronic sleep deficit causes me to nod off. So I get frustrated and set things aside. Then something else catches my attention, I start yet another book, and off I go again. Your memoir has been keeping good company in my stack of still-want-to-finish. I am just about through the memoir of Katherine May. Like you, she walks. The Electricity of Every Living Thing is about the time she walked herself into an understanding that she is autistic. Yesterday I decided that when I finish it, I am going to pull God Never Hurries off the stack, start back at the beginning and read all the way to the end this time. Then your post appeared in my mail box this morning. I must be on the right track again. Content copyright 2013. God Never Hurries. All rights reserved.